Your dentist in Dallas, and the dental hygienists at the office, probably remind you to floss every time you go in for a checkup. Yet, cleaning between your teeth may not yet be a part of your regular routine. You may find that flossing is uncomfortable, or you might just forget to do it every day. 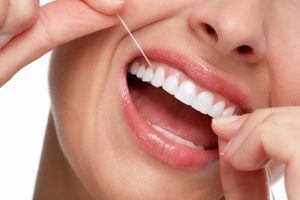 Your dentist is here to explain why flossing is so important and how you can get the greatest benefit from it. Maybe you’ll finally have the motivation you need to integrate flossing into your everyday life. Your toothbrush can go a long way toward keeping your mouth clean. Those bristles clean your outer and inner tooth surfaces, and they dislodge food particles from the chewing surfaces of your pearly whites. Your brush can even help to keep your tongue clean. What more is needed, right? Well… as amazing as your toothbrush is, there are some places it simply can’t reach. The small gaps between your teeth are traps for food particles and bacteria, which can lead to cavities. Don’t believe that’s it’s really that dirty in those tiny spaces? Just use a mouthwash that dyes plaque after the next time you brush; you’ll probably notice that most of the plaque you didn’t get rid of is between your pearly whites. Break off about 18 inches of floss, and wrap most of it around one of your middle fingers. Wind a bit of floss around the middle finger on the opposite hand. Using your thumbs and forefingers, hold the floss tightly. Insert the floss between your teeth, but be gentle. You don’t want to accidentally damage your gums. Guide the floss in a C shape against each tooth, cleaning the area between the tooth and the gum. Rub the side of the tooth in an up and down motion. Repeat this process for all your teeth. Be sure to get the back side of the molars at the back of your mouth. As each section of floss becomes dirty, wind it around the middle finger that originally had less floss wrapped around it. Flossing is a tough habit to get into. You might be able to change your routine by promising yourself a reward if you floss for 30 days in a row. You could also ask your significant other to remind you to floss; make it a family effort! You may be more likely to floss if you find an easier way to do it. Some people use a water flosser rather than traditional string floss to clean between their teeth. However, be sure to talk to your dentist about this; some dental professionals believe that water flossing is less effective than string. Flossing is awesome for your oral health! Be sure to use proper technique so your smile can stay gorgeous and healthy. Dr. Drew Vanderbrook is your friendly dentist in Dallas. He uses preventive dentistry to help his patients maintain their gorgeous smiles, and he always encourages flossing. If you want more information on how to keep your teeth in great shape, contact our office at 214-821-5200.